Just a few miles northeast of Grand Rapids, Michigan, Grattan Raceway Park scribes a winding road course into the Michigan hills. Grattan packs ten turns into a compact two-mile track, and each of them has a unique character to challenge drivers and entertain spectators. On the weekend of August 18-21, almost 150 VSCDA drivers and cars descended on Grattan to participate in one of the club’s favorite events. This year’s event kicked off on Friday with practice and qualifying races, and most of the day saw dry running. Arriving late on Friday, I joined drivers, volunteers, and spectators at the track Saturday morning ready to take in some great racing, and none of us were disappointed. Saturday morning’s heat races set the stage for the rest of the weekend with some great back & forth action. Although Grattan’s two-mile length looks fairly compact, its corners are tremendously challenging, offering experienced drivers some great passing opportunities. As the weekend progressed, I got to experience some VSCDA hallmarks, including Saturday morning’s Trans Am B Sedan feature. 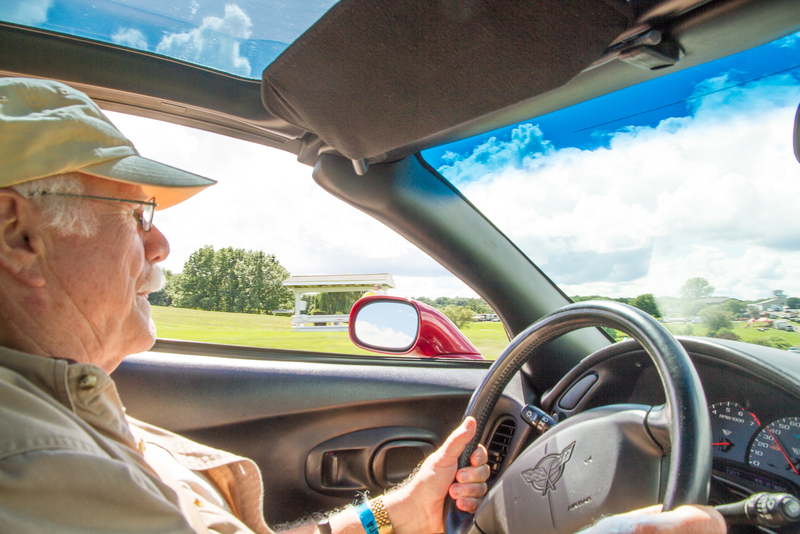 Although most people think V8 pony cars when they hear “Trans Am”, there was a great group of under two-liter cars in the Trans Am series, and in 2009, Steve Bonk revived that competition for VSCDA. He and his brother Chris continue to be driving forces behind this event. Thirteen B sedans competed on Saturday, led by Ike Keeler in his 1971 Datsun 510. Mike Pranka took second in his 1972 Alfa Romeo GTV, and Steve Bonk finished third in his 1971 Datsun 510. Saturday morning’s racing wrapped up with a 12-lap group C sprint race. Scott Livingston took the win in his 1978 Argo JM2, followed by Tom Stephani’s 1978 Crossle 35F and Martin Hancock’s 1989 Lola T8890. Saturday morning’s beautiful skies began to grow heavy by lunchtime, but the early afternoon drizzles gave me some time to catch up with event chair Alex Rorke, who introduced me to VSCDA and some of their longstanding members, including former chairs Scott Fohrman and Barb Nevoral. Fohrman emphasized the social focus of the group, and it became clear throughout the weekend that the VSCA drivers share this sense of camaraderie and sportsmanship. As a non-profit club, VSCDA prides itself on providing drivers with all the track time they could hope for, and the club also gives back to the community. Sunday’s Ride for Charity, for example, raised funds for Wounded Warriors. All of the club members I spoke with over the weekend were enthusiastic about the future of the club and vintage racing. Rorke mentioned that all of the VSCDA’s events were up in attendance at all the tracks they’ve attended, and Fohrman pointed to the decreasing age demographic of club as an indicator of a bright future. Among these young drivers was Robbie Gurolnick, who started racing at age 14. Gurolnick finished 28th in Sunday’s Group B feature in a 1960 Porsche 356 speedster on her way to starting her freshman year at Michigan State the following week. Saturday afternoon’s schedule kicked off with a wet Group A sprint race for Group. As it turned out, the drivers of the open-cockpit Group A cars seemed to catch quite a bit of the wet weather from that point through the end of the weekend, so the drivers that braved the conditions got plenty of track time in the wet. Garrett Van Camp wound up taking the win in the Group A sprint, followed by John Kennelly and Chuck Buysse. Under increasingly threatening skies, a dozen Group B cars lined up for their first sprint race, and the leaders managed to complete five circuits before lightning halted the session. John Salisbury led the abbreviated session, followed by Richard Cook and Jon Bauer. Although nobody expected this when the session ended, this would prove to be the last racing action of the afternoon. The lightning that forced our stoppage was the leading edge of a severe storm that brought high winds and tornado warnings to the area. Luckily, the worst of the weather skirted around the track, and the skies cleared in time for Saturday evening’s banquet for workers, volunteers, and club members. Rorke emphasized the huge role played by volunteers at VSCDA events, as they just couldn’t happen without their generous help. Sunday morning brought overcast skies and cooler temperatures. A couple of warm up sessions opened the on-track activities, and races got underway just before 9:30 with the Spridget (Sprite & Midget) series, led by John Salisbury and Scott Schmidt in 1962 and 1972 Austin Healey Sprites, respectively and Doug Bruce in a 1959 Bugeye Sprite. Feature racing got underway with a full field of 34 Group D cars and some great wheel-to-wheel battles. Bob Leitzinger won the first feature of the weekend in his 1965 Lotus Elan 26R, but had to fight off Mike Kaske in a 1964 Causey Special, who gave Leitzinger plenty to worry about when the pair worked into lap traffic. Mike Pranka was just a few seconds back in his 1972 Alfa Romeo GTV. Doug Bruce leads a pack of Group B cars in his 1959 Austin Healey Bugeye Sprite. Up next was the the Group C Feature. Twenty-six cars took the green flag, and the front of the field was fairly well sorted after the first lap. Polesitter Tom Pixley in a 1978 Wheeler Super Vee relinquished the lead to Jim Kelley in his 1988 Lola SC 8890, and went on to finish second to Kelley, with Scott Livingston rounding out the podium in his 1978 Argo JM2. There were any number of close battles deeper in the field, including Jesse Jurgenson and Frank Newton in 10th and 11th, respectively. Thirty-one Group B cars lined up for their feature race next. John Salisbury led flag-to-flag in his 1962 Austin Healey Sprite. Manley Ford and Richard Cook came in second and third in a pair of 1963 Lotus Super 7’s, having battled back and forth for most of the race. These cars were really well-suited to Grattan’s twists and turns, and lots of drivers enjoyed some great racing all the way through the pack. Some light sprinkles near the end of the race weren’t enough to impact the racing surface significantly, but they’d turn heavier before the next event. The open-cockpit Group A cars once again took to the track in wet conditions for the the Group A Feature and Formula V challenge. Three Lynx B’s covered the podium for his: John Kennelly was first in a 1972 and Bill Styczynski and Garrett Van Camp were second and third in 1969 Lynx’s. Conditions were tricky, and there were a few lazy loops, but I saw quite a bit of close-quarters action through the blind-apex turn nine as these drivers became accustomed to the slick conditions. 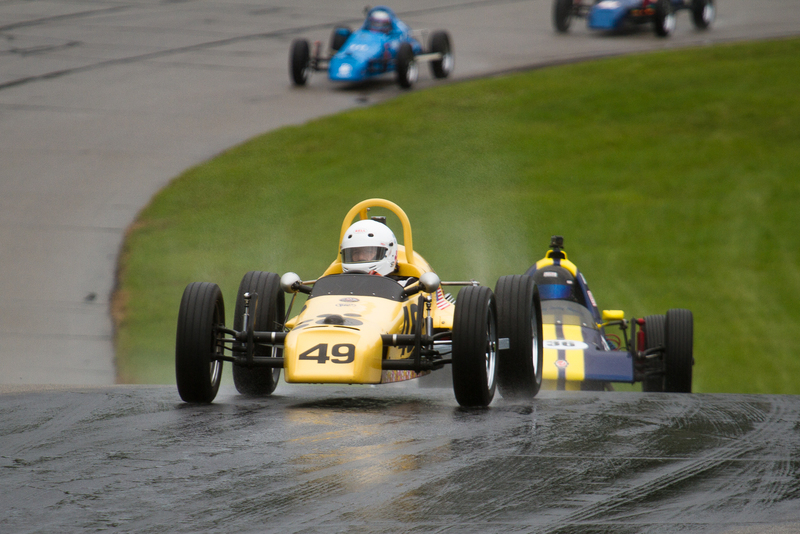 Garrett Van Camp crests a rainy hill in his 1969 Lynx B during Sunday’s feature race. The late morning showers eased over lunchtime, and I was lucky enough to snag a ride with Barb Nevoral in her 1967 Alfa GTV during the charity ride — one of the highlights of my weekend. Several drivers took turns running a couple laps at “4/10” speed, but the grins on the faces of the riders were all 10/10! Sunday afternoon’s sprint races were shortened by a couple laps each in order to make room for one of the Saturday events that was scrubbed by the weather. Group D led off the afternoon under clear skies, with Bob Leitzinger taking the win once again from the pole. 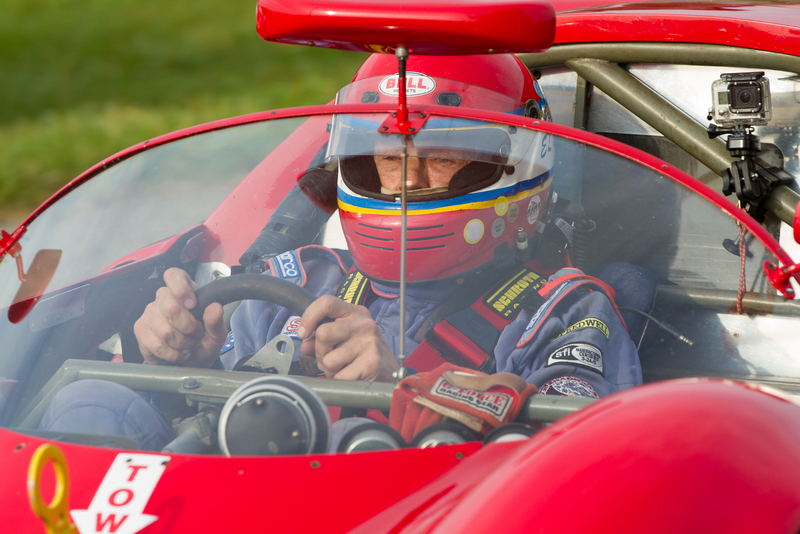 Mike Besic advanced from a third-place start to take second in his 1969 Alfa Romeo Duetta, and Mark Brown was third in a Super 7 from his outside-pole start. I watched this race from turn three, which crests and dives sharply to the left, offering the drivers a couple of great alternate lines and even an occasional passing opportunity. Just like clockwork, skies darkened again as the open-cockpit Group C cars lined up for their sprint. Seventeen drivers hoped for the best, but the skies opened up again after a couple of racing laps. Five drivers stuck this one out to the end, with Scott Durbin leading in his 1977 Tiga FFA despite a quick spin coming out of three. James Britnaell followed in his 1972 Mallock, and Frank Newton rounded out the podium in his 1971 Titan. Drying conditions greeted the Group B driver for their sprint race, but the field had thinned a bit since morning, leaving just ten drivers to take the green. John Wittenauer took advantage of the drying track and light field to take the win in his 1964 Mini Cooper S, followed by John Deikis in a 1968 MG Midget and Nathan Burress in a Bugeye Sprite. The Group A Sprint wrapped up the published schedule with a welcome dry race. Sixteen drivers stuck around for this event, led from the pole by Chuck Buysse in his 1967 Kellison. Frank Newton hung onto Buysse to grab the runner-up spot in his 1969 Lynx B, and Bill Styczynski moved up several spots to finish third in another 1969 Lynx B. Thanks to Phil Cull for a couple of great trips around Grattan – this is the pace lap for the Can-Am challenge on Sunday. The Can Am Challenge wrapped up the racing day, having been rescheduled from Saturday afternoon. The late start really took a toll on the entry list, though, leaving a three-car field to race for the podium spots. 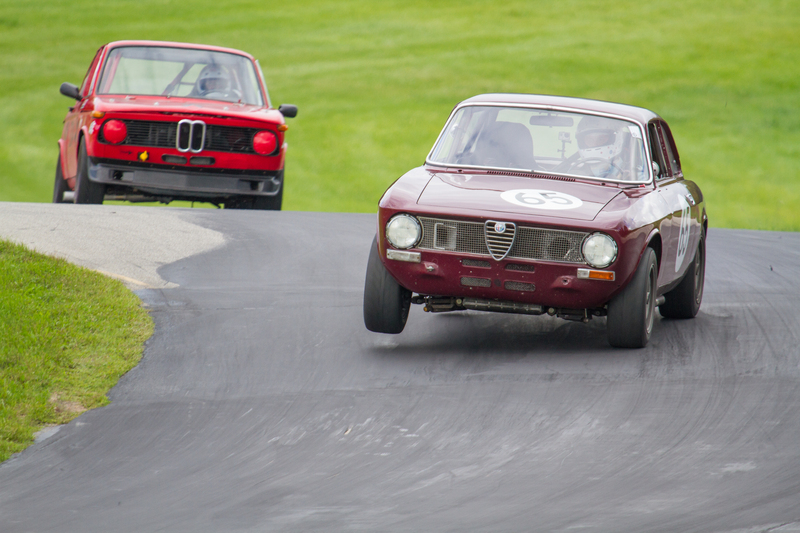 Mike Pranka took the honors in this one in his 1972 Alfa Romeo GTV, and Greg Herr in a 1972 Porsche 914 and David Michele in a 1972 Alfa Romeo Alfetta rounded out the day’s racing results. 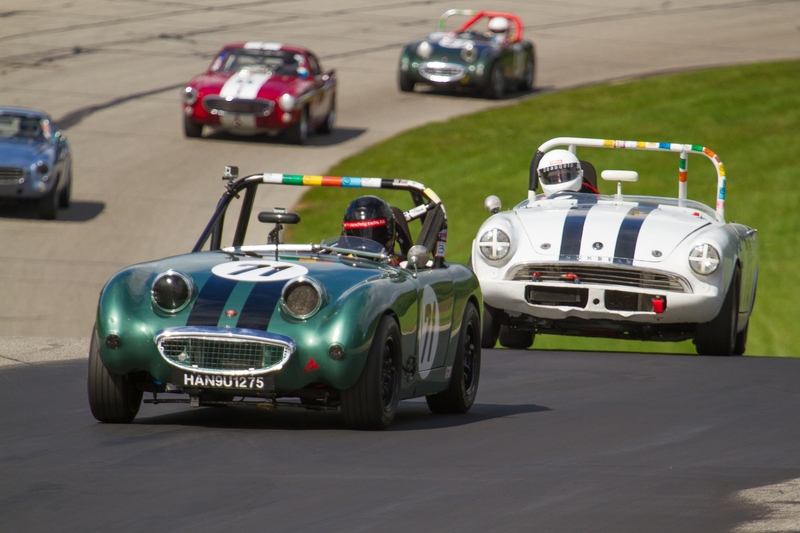 The next event for the VSCADA is the season-finale at Road America on Sept 16-18.